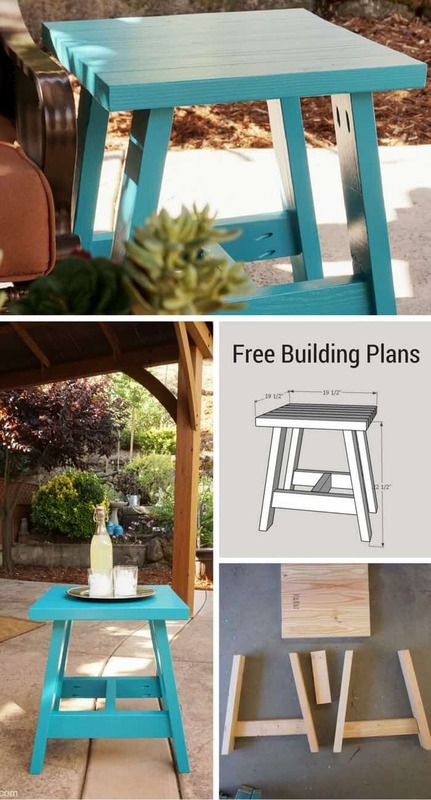 Build a 2x4 Outdoor Table with My Free Plans - Girl, Just DIY! So many more women are into DIY these days. It’s fun, it’s challenging, and you can save a ton of money doing stuff yourself. I made my first piece of furniture all by myself and I want to show you how to make your own 2×4 Outdoor Table. This project uses simple and inexpensive building materials so you get stylish furniture for your home or patio on a small budget. 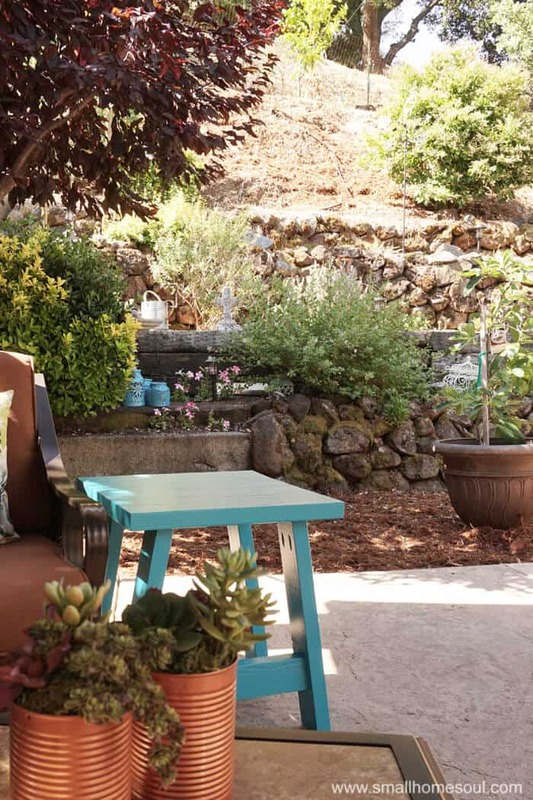 Have you priced out patio furniture lately? It’s kind of ridiculous they charge for something you only use a portion of the year. That’s why I decided to build my own 2×4 table and save a bundle in the process. Also, our patio furniture set didn’t include any side tables. I’ve been wanting to try my hand at building a piece of furniture by myself for quite a while. So when a blogger I’ve been following for years posted in a group that she was doing a 2×4 challenge, #2x4andMore to be exact, I knew I wanted in! There is nothing like accepting a challenge with a deadline to get me moving. I’ve been inspired for some time by blogger friends like Anika’s DIY Life and The Handyman’s Daughter who build furniture, by themselves. I love making stuff and I new I just needed to get busy. In this challenge there are 14 building-minded bloggers participating, so please make sure you read all the way to the end of the post so you can check out their awesome projects too! The rules were simple, at least 85% of what you build has to come from structural lumber like 2×4, 2×6, 4×4, etc. 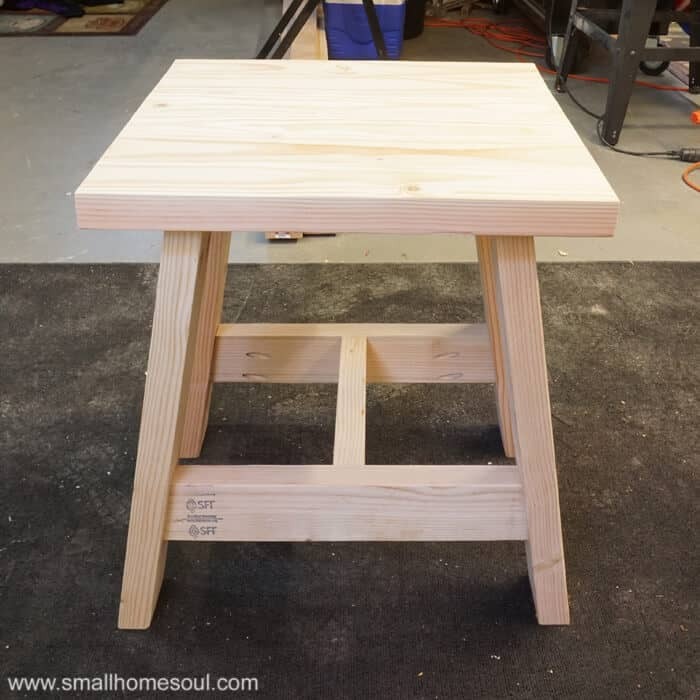 I knew exactly what I wanted to build because I was inspired by my friend Janice’s Barstool design, I changed it a bit so I worked as a side table. I’ve took the extra steps to create some building plans for you. 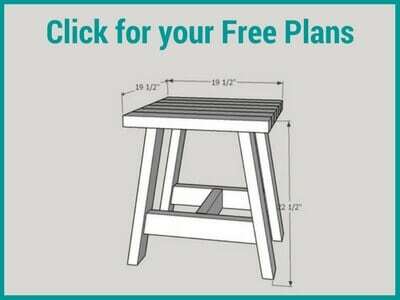 You’ll find a link to the free 2×4 Outdoor Table building plans at the bottom of the post. This post contains affiliate links for your convenience. If you purchase an item after clicking on one of my links I may make a small a commission, at no cost to you. I recommend Kiln Dried so they won’t shrink or warp as they dry. Purchase four (4) 2x4s to ensure you have enough. Even the pros make a bad cut now and then. Select the straightest boards they have with no twists or warping as this will affect the outcome of your table. Cut one (1) 2×4 board to 11-1/2” for the Center Support. This board has a standard 90 degree cut. * For my table I trimmed 1/8” off each short side of the 2×4’s for a more squared look. This isn’t necessary. 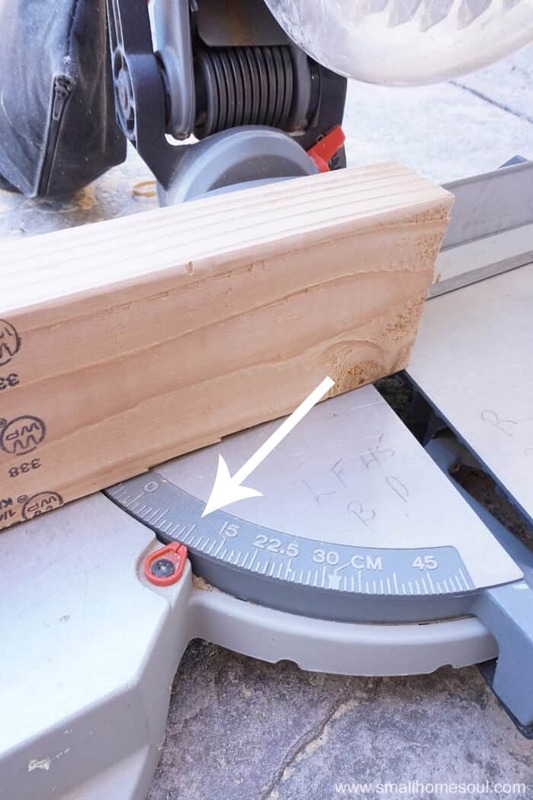 If you choose not to trim your 2x4s increase the length of the six (6) top boards to 21” to ensure your table top is square. 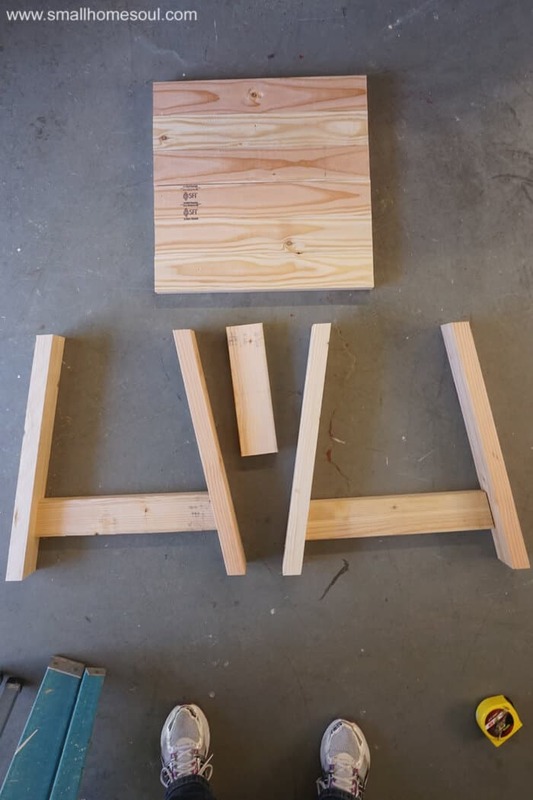 ** This website will better describe a Miter versus a Bevel. Cut all boards to the measurements above. Pay close attention to the bevel and miter cuts as noted. The detailed plans offered below go into more detail for assembly. When cutting the Cross Leg Supports make sure the top is narrower than the bottom. Measure twice, cut once. Sometimes I really have to think about it before I make my cut to ensure the angle is correct. I hate wasting wood. To cut the bevels for the legs I actually used the miter angle I’d already set by standing the 2×4 on end. This is a cheater way if you don’t have a compounding miter saw that can make a bevel cut. Here’s what all your parts will look like when cut. I loosely put them together how they’ll be assembled. Now it’s time to make the pocket holes. Play around with a few scrap pieces to get the feel for it. 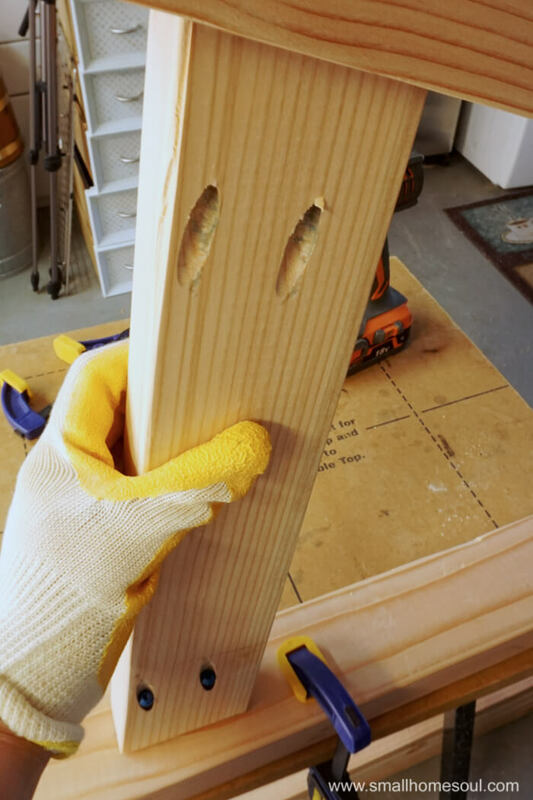 If you’ve never used a Kreg Jig to make pocket holes I suggest you bookmark my friend Anika’s recent article and video “How to Use a Kreg Pocket Hole Jig.” I wish I’d seen this before I started because there is a small learning curve but once you’ve done it a few times it’s awesome! When all the pocket holes are drilled according to the building plans, I suggest pre-screwing the pocket hole screws part way into the pocket holes. This will make the assembly go a bit quicker. Make sure the screw doesn’t extend out of the board. To determine the proper spacing of pocket hole screws for the top boards I researched on the Kreg website. 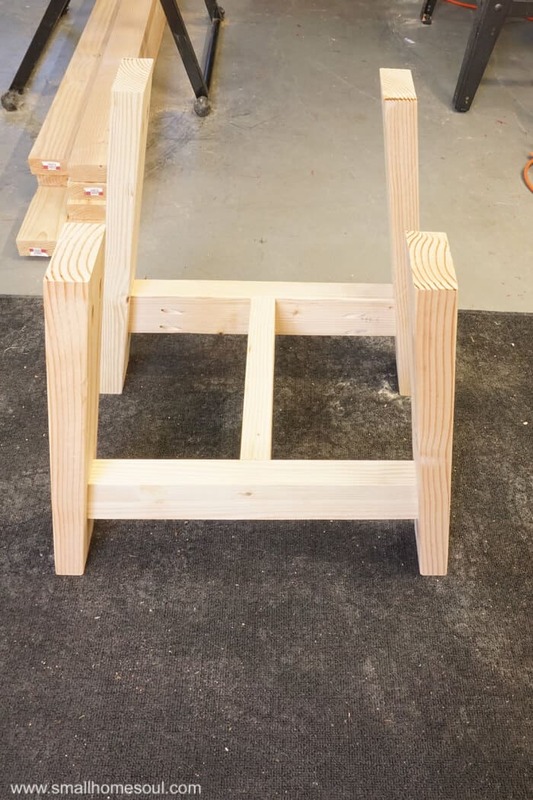 I wanted enough for good connection and support, but I needed to make sure the pocket holes connecting the top slats wouldn’t be in the way when I was ready to assemble the base. This is covered in the Building Plans but only 5 of the top slats will get pocket holes, they aren’t needed for the 6th board. Long clamps will make this project go much smoother. Start with the top and lay the boards on a flat work surface. 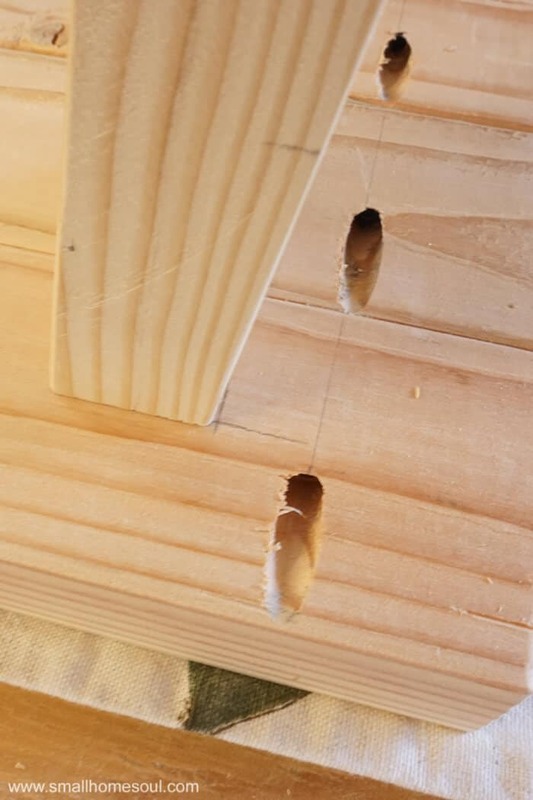 Run a bead of wood glue between each 2×4 and clamp all six boards together. Working on one board at a time screw in each pocket hole screw the remainder of the way. I made my shorter clamps work but it’s always best to have the right tools. You can see more of this in the Building Plans. I will have longer bar clamps before my next project. Shhh don’t tell my hubby, he kept telling me to go buy some but I wanted to build the table with what we already had. I was successful, but long bar clamps would have made it easier. Take two of the legs cut at 10 degree bevels and one of the mitered cross leg supports. Measure up each leg from the bottom and make a mark at 4-3/4″. The bottom of the cross leg support will sit on that line and will be centered on the leg. Hold the cross leg support in place and drive in the pocket hole screws. This is where I wish I had one of the Kreg Jig right-angle clamps. I was working by myself and while I made it work, that clamp would have saved so much time and ensured my joint was as perfect as I wanted it to be. Don’t you love the yellow garden glove, that grippy texture helped me hold on tightly to the 2×4. After the front and back legs are assembled it’s time to attach the Center Support. Find and mark the center of each cross leg support. Attached the center support to each of the table legs. You can see better how I connected the Center Support in the video below. After the base of the table is assembled it’s time to attach the top. Make a few marks on the underside of the the table top so the overhang is even all around. 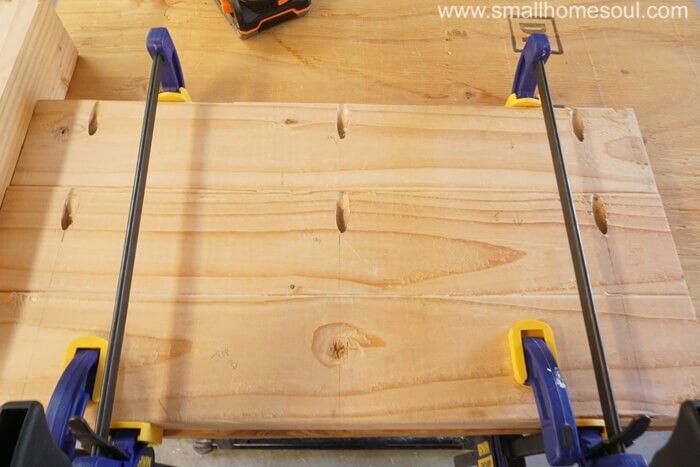 Turn the top upside down on your work surface with the slats running horizontally. On the front and back near the edge draw a line near the corners at 1-5/8” then draw a line at 2-3/4” on the sides. The corner of the leg will line up where the two lines meet. Attach each leg to the table top using the pocket holes and screws. I decided to paint mine a fun color for my patio. Last Summer I did a Patio Refresh Series but it still wasn’t bright enough with all the brown on the fence and on our rust-colored patio furniture. I put it to a vote on Instagram and on Facebook and Teal won. I walked into the hardware store and literally chose the first paint chip I picked up. Hawaiian Teal, how could that be bad? So how much did these tables cost? I bought kiln dried 2x4s for my 2×4 Tables that cost about $3.29 each. That’s less than $15 per table and with the cost of paint it’s around $20 per table. Buying a wood table would cost much much more. They’re ready to hold a refreshing beverage while I enjoy the shade of our gazebo. I hope you love these tables as much as I do. They’re stylish and sturdy, and in a pinch they can even be used as extra seating. 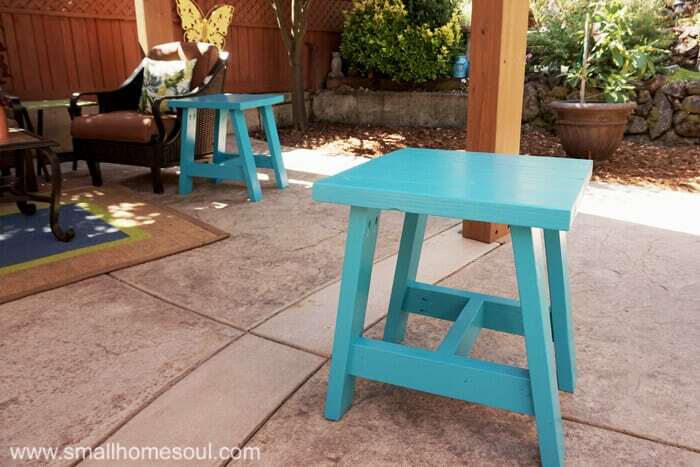 I’m beyond thrilled with my new 2×4 tables, my patio is already brighter and more cheery. Thanks for sticking with me on this very long post. As promised here’s the link to request building plans for these 2×4 Outdoor Table. 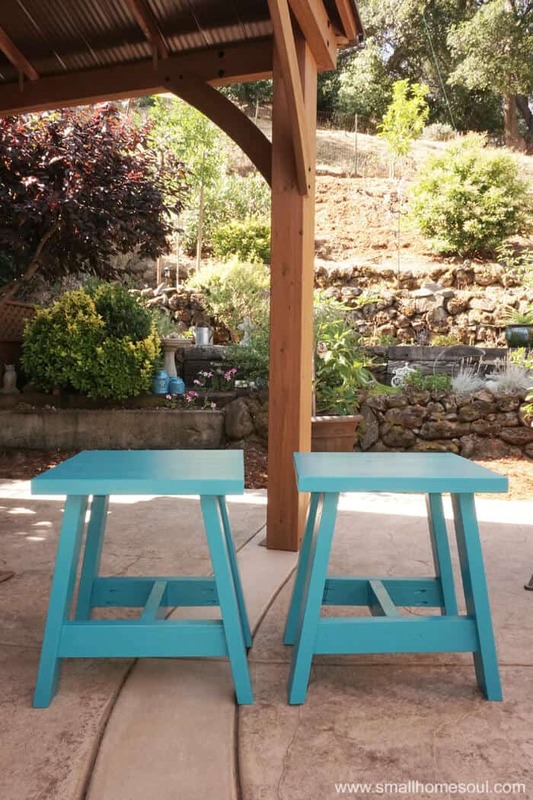 The Remodelaholic #2x4andMore challenge inspired me to build my 2×4 Outdoor Table. 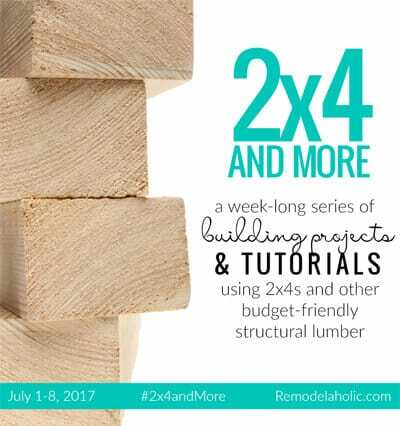 For a full week of structural lumber projects be sure to visit Remodelaholic. Don’t forget to check out all the projects in this challenge by visiting these talented bloggers. 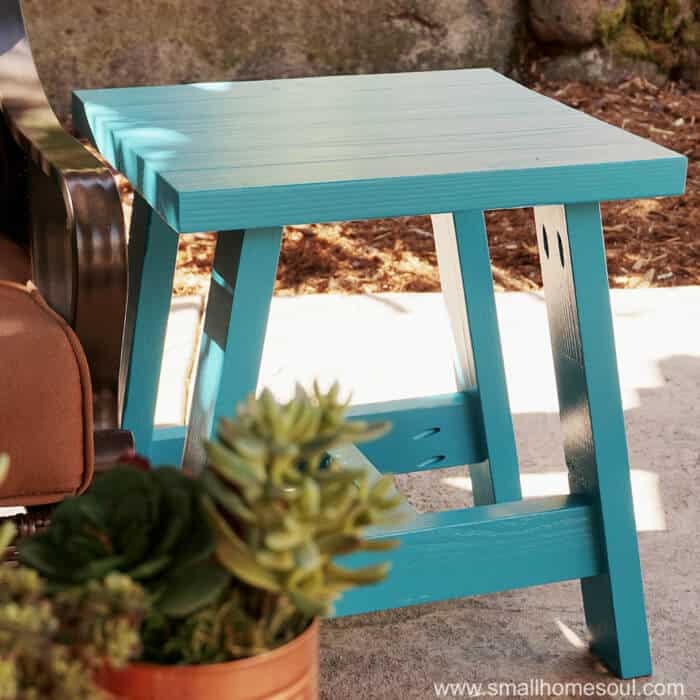 patio side table | Girl, Just DIY! I loved how your tables turned out! Congrats on your DIY wood project! I’m a bit in awe of your post! Hi Toni- I LOVE these tables! And the color is perfect! Your site has so many fun ideas and your instructions and videos are great. Very inspirational. Thanks ! ?? Toni I love these tables!! 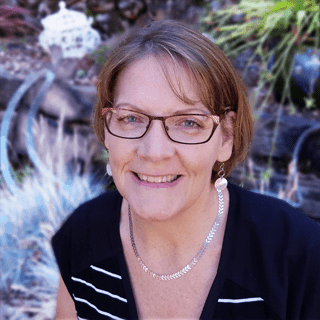 You did a fantastic job…and you know that teal has me all giddy inside!! Wonderful tutorial and I love that they could also be used as extra seating. Thank you for sharing with us at Create and Celebrate!! Thanks Susanne, we’ve been using them on the patio this week and last week when my sis and I had coffee out there in the mornings. This is a great little table and your instructions are easy to follow. I have pinned it. Thank you Barbara, I appreciate the Pin and I’m so glad you like my tables. Love your table design. I bet you’re hooked on that Kreg jig now! Thanks so much Sarah, and yes I want all the Kreg tools now! What app did you use to design this item? I’ve been looking for one for a while now, and none of the ones I’ve found have really been what I was looking for. 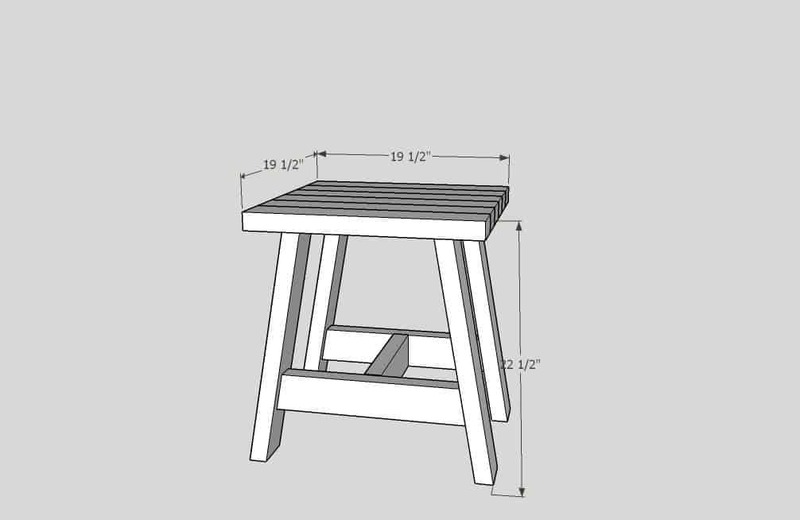 I know I replied to you by email Keith but I’m commenting here so others can see that I used Sketchup to create my plans for the table. Toni! It’s beautiful! I agree about most tables on Pinterest are a little too boxy. The angles on this table are perfect. And that color!!!! You did a fantastic job!! I love the colors and the flower, beautiful outdoor table! LOVE IT!!! 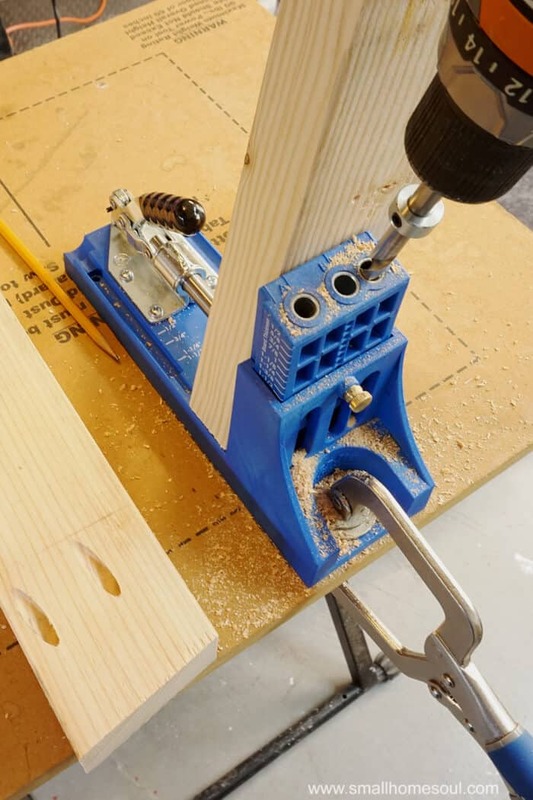 It is impossible to believe that you have used a Kreg Jig for the first time! And I especially love the color you picked! It is perfect! This is a great project and WOW check out home many times its been pinned! You go girl! Very clever and practical. I could do with one of these tables in my garden especially in that lovely blue colour it would go with my outdoor furniture. Claire I hope you get to build a few for yourself, and I know you will paint yours something bright as well. Thanks Janet, the color is so vibrant it really perks up my patio a ton. And they’re my favorite color!!! These are so cute! 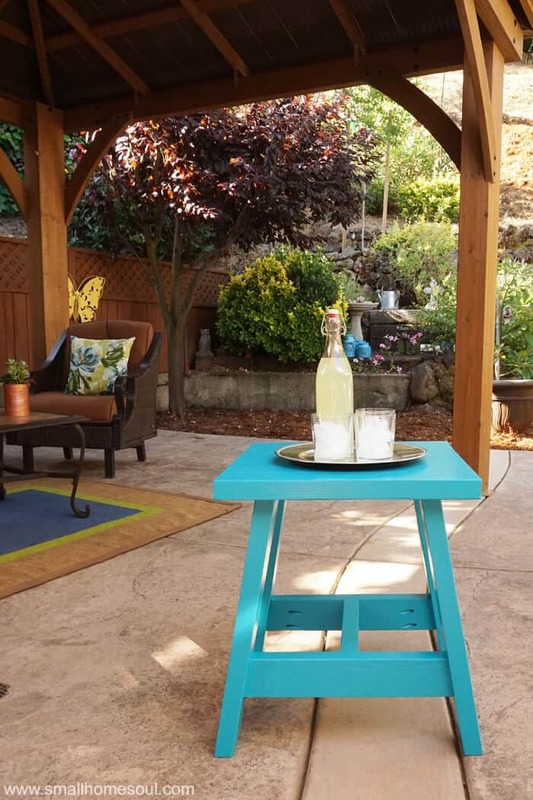 I am needing some new patio side tables so these are definitely going on my to-do list! 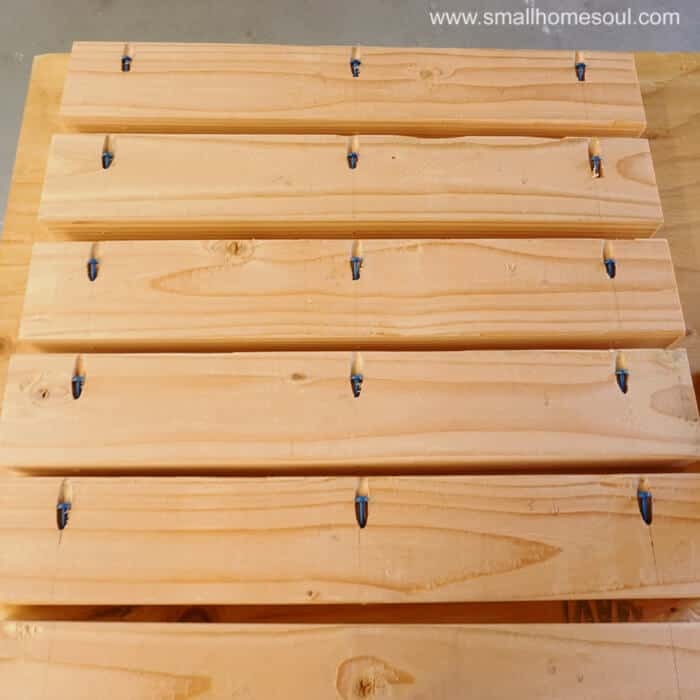 Love that they are made from 2×4’s – easy and inexpensive – my kind of project! Thanks for the tutorial and plans! You’re welcome Denise, I hope you get to build yours soon so you can start enjoying them this summer. These are great! What a perfect design and the color is so bright and cheerful! These could go just about anywhere, if you ask me! Charlotte, what a great challenge that was to participate it. Yes, they are bright and cheery and just the kick my patio needed. Thanks Ginger, they are so sturdy they’ll even make extra seating in a pinch! CUTE toni! This looks like such solid construction for a back patio! Thanks Anna, I’m so happy I decided to make two of them. Toni, this looks great! Are you hooked on that Kreg Jig? I sure love mine! I also love the color you chose!